You may have heard the expression “cut your losses early” before. This is probably the most profound wisdom for stock investors. The table below will illustrate the reason behind this insight. If a stock loses 10% of its value, it only takes a gain of 11% to make up the loss. If a stock loses 20% of its value, it takes more effort at a gain of 25% to make up the loss. 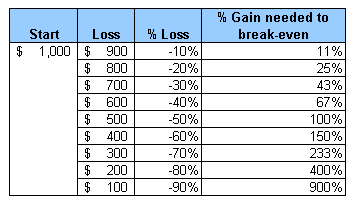 If a stock loses 50% of its value, it takes improbable gain of 100% to make up the loss. If a stock loses 90% of its value, it takes impossible gain of 900% to make up the loss. This is why stop-loss order of 10-20% below the price at which you bought is recommended. It takes enormous effort to recover from anything greater than that. Before you sell, you should do your due diligence and identify the underlying reason of the decline. It doesn’t make sense to simply sell because the stock value dropped. This main point of this demonstration is to address the false believe that it only takes 30% gain to make up for 30% loss, etc. In term of dollar amount, it only takes a $5 gain to make up a $5 loss. How often do you see a stock that is badly beaten (i.e., dropped 20% or more) recover in a very short period of time? Instead of hanging on, the stock could be sold for tax-loss harvesting and reinvest in other stocks (even similar ones — i.e., as I have done when I sold SSREX and bought VNQ). Risk assessment in financial markets is always a tricky venture, I like the way you’ve broken this down as invariably it is usually better to cut your losses early. Ahh I got it. That’s a good point. I see that I’m still relating to the high position, the $1k by your example, and not the new position. That’s what I have to work from at that point, this is good, luv learning stuff like this, thanks Pinyo. Frank – welcome to Moolanomy. There is no additional cost per se. The point of the table is that many new investors mistakenly believe that 50% loss can be recouped by 50% gain, when in fact that’s not true. If your $1,000 position lost 50%, then it’s currently at $500. A gain of 50% on $500 will bring it up to only $750, not $1,000. That table is great but I don’t understand what’s behind the numbers. What is causing the additional amount needed to breakeven? If I’m holding onto a stock that dropped 50%, where is the additional cost? my personal view is that it depends on the level of risk you are willing to expose yourself to. I personally see stocks and shares as a medium to long term investment and traditionally stock markets always follow an upward trend if you are willing to hang in their long enough. I think that as you get older it is probably worth reducing your exposure and investing in government bonds, but as i’m still in my early thirties i’m happy at ride out the tough times, however tempting it is to sell. Interesting post though. Mark – I think it all depends on the particular stock. You will have to do a due diligence and see what level of loss you are comfortable with. As you can see from the chart, I think it make sense to cut it at around 20% loss. How would I be able to apply this towards dividend paying stocks (I have a few that are DRIPS) ? @John – Thanks. I will look it up. @Money Blue Book – That’s another way to look at it. @Mrs. Micah – Index is a good start, but to achieve even better result try asset allocation with different types of index funds (or better yet ETFs) and rebalance at least once a year. It’s hard not to hope that it’ll at least get a bit better, or that the slump is the dark before the storm. Hence why I plan to stick with such investments as Vanguard’s S&P 500 index. It is sort of like the power of compound interest in reverse. The more money you have, the greater the amount it will grow. The more you lose, the less you have, the greater effort it will take to further grow it. @John – Good point about stop loss that’s too narrow and ending up wasting a lot of money. By the way, what book did your write? I would love to read it. @Joel – It’s very psychologically difficult to cut your losses like KMC said below. @Steve – That’s another good and subtle point you make. Don’t anchor the stop loss against the price paid, I think the stop loss should be adjusted as the stock rises to protect the profit. @KMC – Good point about capital loss tax deduction. In fact, I just sold some losing stocks to take advantage of that incentive. Unfortunately, people (myself included sometimes) would rather anchor the value of a fallen stock to the price they paid for it. It is always easier to assume the market is wrong now, rather than you being wrong then. A single unemotional look at your chart should show why this thinking is unwise. My book is The Essentials of Trading, published by Wiley last year. And I agree with Joel on the O’Neil book. I actually credit that one with laying the foundations for much of what I do in the markets today. I just read a book by Jason Zweig (that I reviewed) where he mentions this. People don’t sell their losers because it turns a paper loss into an actual loss. People are so physiologically averse to realizing a loss, they’d actually rather keep the stock and not admit they were wrong, despite the fact that you’re given an incentive to do just that by the government (via the capital loss tax deduction). It’s tough to fight biology. A great book on investing that discusses how cutting your losses is one of the most important things an investor can do is “How To Make Money in Stocks” by the classic William O’Neil. People (including me) take their gains way too early and cut their losses way to slowly. Never really understood it. Very good point to make. I put a very similar table in my book. The one thing I would add, though, is that having stops that are too close can be just as bad as having ones too far away. I mention this because a great many traders fall into the trap of thinking that close stops mean less risk. The truth of the matter is that stops which are too close increase risk because they increase the probability of the stops getting hit by what is normal volatility. A well placed stop is one which is at a point where if it gets hit it means the market isn’t going to do what you expected it to do.